Jerusalem Affairs Minister tells Rusian Ambassador Russia has a chance to become the first nation to move its embassy to Jerusalem. 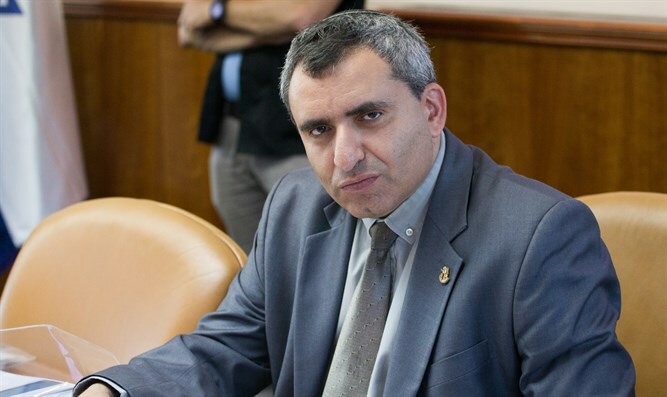 Jerusalem Affairs and Environmental Protection Minister Ze'ev Elkin (Likud) spoke Thursday evening at a special event held by the Russian Embassy in Tel Aviv in honor of Russia's National Day, which will take place next week. At the end of his speech as representative of the government and after stressing the role the Six-Day War played in shaping the relations between the two countries, Elkin appealed to the Russian ambassador to Israel and suggested that Russia act ahead of the US and become the first country to move its embassy to Jerusalem. "As Jerusalem Affairs Minister, I cannot help but hope that you and your country will take advantage of the half-year break that the president of the United States has unfortunately taken, and in the next six months, to win the competition between the two powers and beat the Americans to the punch." "You will be the first country to transfer its embassy to Jerusalem. This year in rebuilt Jerusalem," Elkin emphasized to the ambassador.